I like to cook but I hate cutting stuff up. Even salad is too much of a chore. Years ago, I got in the habit of just buying the stuff my sister-in-law calls “Yuppie Chow” – salad in a bag. Then I met my husband. He loves cutting stuff. Chopping, slicing, dicing. We’ve had some terrific salads. But he has a tendency to make stuff a little bit bigger than bite-size. We’ll get some giant cucumbers out of the garden,and he’ll just slice them up like green hockey pucks. Huge tomato wedges too. Delicious; but literally: A Big Salad. Then there’s meat. My husband is a great carver. With Thanksgiving coming up, I know I’ve got the best all-time turkey carver in the land. But on the other hand, he’s a dicing perfectionist. If I ask him to dice some ham for an omelette, I usually make sure I have a magazine to read while I wait. Because every cube has to be precise. It’s like cooking with a hundred pink dice. We have some highly symmetrical breakfasts. 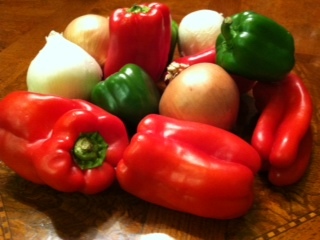 So yesterday I asked my husband to pick up some onions and peppers for a nice sausage-and-pepper supper. He’s a terrific vegetable shopper, and in his retirement, he has learned which markets have the freshest produce. He bought enough for a banquet. And when I got home, he had already started cutting the onions. REALLY cutting. For a guy who cuts salad pieces a tad on the enormous side, he must have been working on the onions since early afternoon. He had a mountain of diced onions. And they were tiny. Diced the size of grains of rice. The pile was rather pretty, like a pyramid of translucent sequins. I took over before we had pepper microdots too. The sausage and pepper dish was delicious. The onions added a delicate flavor, with the miniature granules dissolving instantly in the saute pan. “I took over before we had pepper microdots too.” You’re so funny. Happy Thanksgiving to both of you. Reminds me of my husband when he goes outside to clean something, such as a cooler. I’ve often thought: give him an 8-oz tumbler you want cleaned and a full bottle of Fantastik, and when he finishes, that bottle will be empty! My husband takes stuff down to the basement to clean…not sure what the process is, but it’s lengthy! I love the way you describe! Loved it and I could totally picture you sitting off with Cosmo while he is intent on the task at hand. My husband loves to dice too. It’s crazy, isn’t it? Maybe because before they retired we did all the dicing and deep inside they KNEW we were just fabulous with how we chopped, diced, boiled, roasted, listened to kids recite their French verbs, kept an eye on the dog in the corner chewing on someone’s toy train, greeted our husband with a sweet smile AND entertained him with the latest neighborhood gossip (whew) AND SO, they are secretly competing with all the years we shone in the kitchen. A delicious pre-Holiday post. Thanks! And Happy Thanksgiving to you and to all your zillions of readers. I find vegetable chopping really therapeutic so I was enthralled with your descriptions! I once did a blog post about it called Need Some Calm?. Have a wonderful holiday weekend! I like ironing – that’s therapeutic to me. And weeding, on a nice hot summer day. My retired husband is the ultimate griller. When it comes to vegetables, it’s dicey. First off, it would be just corn — no dicing necessary! I love yuppie salad. Even though retired, I still use it. I only chop when necessary and my favorite is the already cleaned and chopped butternut squash! Great blog. Wonderful descriptions! Your husband is a keeper! I love to cook, and grill. Props to your hubs. I would have never guessed I would enjoy reading about dicing?! Delightful as always. Wishing you all the best. Counting your blog as one of my many blessings this Thanksgiving. How do you do it? You can make any topic, even dicing veggies, funny and interesting! I don’t care for dicing and have bought many devices guaranteed to make chopping eassier. But then I have to clean the darn things!!! Not so easy. I enjoyed this post. You two must put together some very nice looking meals. What a great post! I actually like chopping vegetables. I’m not much of a cook (in part because I’m a non-vegetarian who can’t stand looking at or touching raw meat, and no, its not just an excuse but it works : )), so I end up being the salad maker at most meals. But I think there must be some top secret Men-Only Salad Makers course, because when my partner does take salad duty he does it exactly like your hubby! The pepper chunks are so big I can’t always fit them in my mouth! I found your blog through Lorna’s blog awards, by the way, and greatly enjoyed my visit! Great post…and you are one lucky woman…he sounds like a keeper! Have a happy cutting, chopping, slicing, dicing Thanksgiving! Now I’m hungry for some sausage, onions and peppers. Coming from a pescatarian, that’s saying something! I love your writing. And your humor.